Yes, the glacier of Glacier Bay is receding—as it has from time to time for centuries. When President Obama and Secretary of State John Kerry visited Alaska this week, they pointed to the receding glaciers as evidence that humans are the cause of “dangerous,” even “catastrophic,” climate change. Messrs. Obama and Kerry have been seriously misinformed by their advisers, including chief science adviser John Holdren, who is a leading alarmist on the subject. If only the president had consulted the history of Glacier Bay, where the Huna Tlingit people have lived for more than 4,000 years, he would have found a different story. It is a historical fact that the glacier in Glacier Bay began its retreat around 1750. By the time Capt. George Vancouver arrived there in 1794 the glacier still filled most of the bay but had already retreated some miles. When John Muir, founder of the Sierra Club, visited in 1879, he found that the glacier had retreated more than 30 miles from the mouth of the bay, according to the National Park Service, and by 1900 Glacier Bay was mostly ice-free. All of this happened long before human emissions of greenhouse gases, including carbon dioxide, could have had any impact. In the oral tradition of the Huna Tlingit people, it is said that the glacier has advanced and retreated a number of times during their occupation of the area. 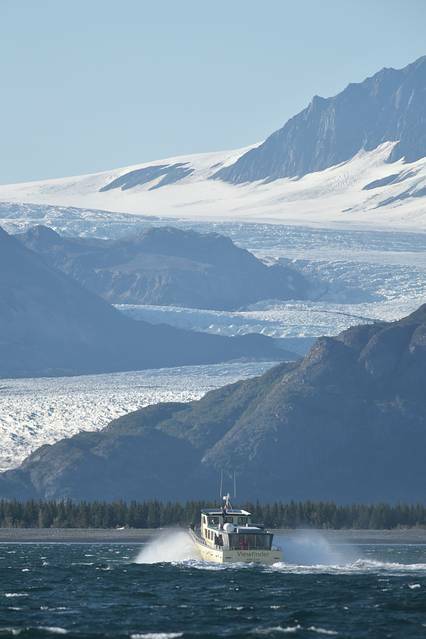 Each time the glacier advanced they would move to the village of Hoonah in Icy Strait outside Glacier Bay. When the glacier retreated, many of them would move back into the bay. These multiple migrations were certainly caused by climate change, but it had nothing to do with human activity. The fashionable tendency to blame every change in climate and every extreme-weather event on human emissions is doing a grave disservice to the scientific tradition. We know that the climate has been changing for millions of years due to a multitude of perfectly natural factors. There is no reason to believe that those factors have suddenly disappeared and now humans are the all-powerful shapers of global climate destiny. Yet this entirely unproven hypothesis of catastrophe is compelling to those who would control our beliefs. Politicians want us to believe they are saving us from ruin; religious leaders want to reinforce original sin and the need for repentance; some business leaders want us to subsidize their expensive “green” technologies; and the climate activists want their money-machine to keep on giving. This powerful convergence of interests ignores the fact that carbon dioxide is essential for all life on Earth, that plants could use a lot more of it, and that the real threat is a cooling of the climate, not the slight warming that has occurred over the past 300 years. Mr. Moore, a co-founder and former leader of Greenpeace, is the chairman of Ecology and Energy with the Frontier Centre for Public Policy in Canada, and a director of the CO2 Coalition in Washington, D.C.
Posted on September 4, 2015, in Postings. Bookmark the permalink. Leave a comment.